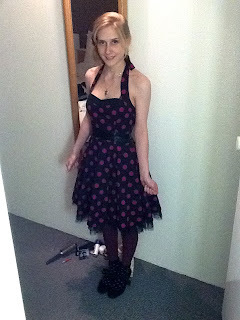 Today's dress is a party dress I bought in London two years back, when I was suffering from the most heinous cold. Charles and I were there with another friend for New Year's Eve right after visiting Paris for Christmas. I can't believe how sick I was, it was intense. We went to the Camden town markets and I couldn't talk without coughing, and I just bought two dresses without even trying them on because I wanted to feel better. I was a zombie. 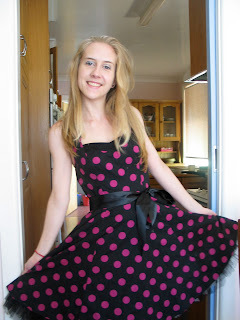 There's another dress coming in the next two days that I bought on the same night! I never really think that halter necks look good on me. Maybe I just don't like how it feels on my necky neck. Nice and cool for summer though! Here's me at This Is Not Art in 2011. Charles and I performed our duo there! This picture reminds me - I forgot to wear the waist ribbon today!